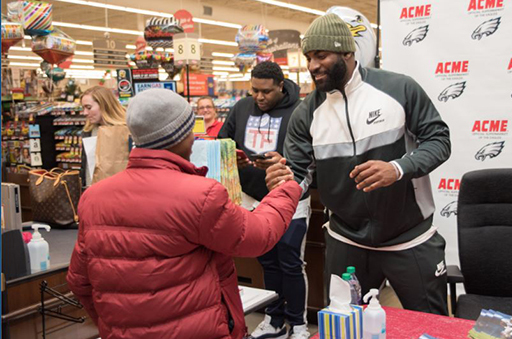 WASHINGTON, D.C. – Vinny Curry has been named Week 11 NFLPA Community MVP following his second annual Thanksgiving Rush program that provided Thanksgiving meals to 200 families in need. The Eagles defender put that message into practice on Monday. For the second straight year, Curry partnered with ACME Markets to hand out a turkey or ham along with several side dishes to 200 families (800 individuals) in the inner city of Philadelphia. There, he met with each of the families, posing for photos and signing autographs to help lift their spirits and ease their financial burden during the Thanksgiving holiday. Curry will be back at it next month, spreading the seasonal spirit of giving for his second annual Christmas Rush program. Two hundred more families in Philadelphia will receive holiday hams and one-on-one time with the six-year veteran. Both initiatives are an extension of Curry’s Rush2Victory Foundation, which was launched in 2016 to bring positive change to the lives of low-income children. In just one year, the organization has impacted 2,790 lives, thanks to outreach efforts like Rush2Lead, where he holds assemblies in inner-city schools and community centers to engage with at-risk kids. Earlier this year, Curry met with 60 students in two separate classrooms at Alaine Locke School, serving as a mentor, providing them with notebooks to map out their goals and encouraging them to start their own path as positive role models in their community. “I’m so blessed to have football as a platform to make an impact on the lives of children by empowering them to achieve their dreams,” Curry said. In honor of Curry being named this week’s Community MVP, the NFLPA will make a $10,000 contribution to his foundation or charity of choice along with an in-kind donation to him on behalf of our supporting partner Delta Private Jets. Curry, along with the other 2017 Community MVPs, will also become eligible for this year’s Byron Whizzer White Award, which is the highest honor that the NFLPA can bestow upon a player.